I have found that over the past couple years of movie reviewing, that my tastes have changed a little bit. I find myself gravitating to more real-life dramedies (drama/comedy mixed) that give more to relate to in means of story and characters. Last week I watched two such films that I had been anticipating watching and I share my thoughts with you. Today, here are two quick mini-reviews for Safety Not Guaranteed and The Perks of Being a Wallflower. Safety Not Guaranteed was in my local theater for only 1 week and…as odds would have it…I went to go see it the day AFTER it left. I didn’t know it was only playing for such a limited amount of time. I had to wait until it released on Blu-ray to finally be able to see it. And I am so glad I got to watch it! This film is a movie that consistently keeps the question of “Is it real, or is he crazy?” alive in the back of your mind. 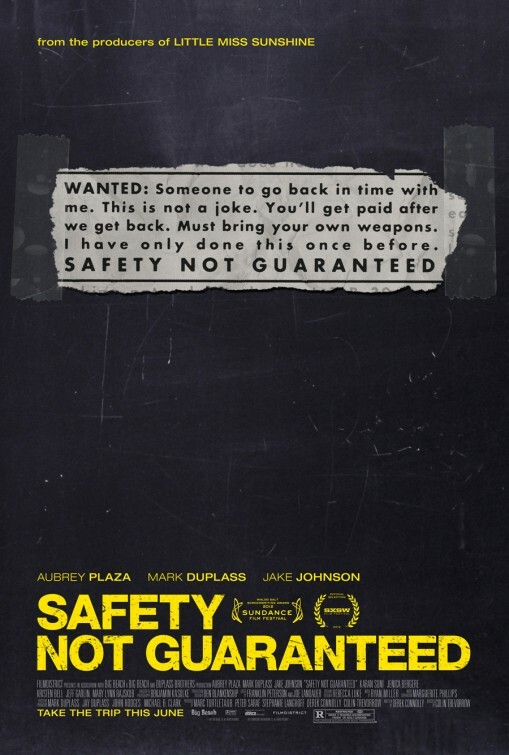 Much like K-Pax, The Green Mile, Phenomenon, etc; Safety Not Guaranteed keeps you guessing as the story unfolds. Because it is not a story about whether or not the man they are investigating is crazy as much as it is a story about the man himself and the importance of living life out of one’s comfort zone where safety may not always be guaranteed, but adventure will be. An idie film that blends drama, comedy, scifi, and real life together in an original manner that allows the focus to truly be on the story itself. Duplass and Plaza have an on-screen relationship that is touching and fun as the two partner up to prepare for a travel back in time in hopes of fixing something that had gone wrong in their lives. Everyone has something in their past that they wish they could go back and alter/prevent from happening. What would you do if you found someone that strongly and convincingly believed they had figured out how to do that? Safety Not Guaranteed explores that possibility and the journey the audience takes in watching the movie play out is one that is nigh unforgettable. This is a feel good movie that I was glad to have seen and that is a “dramedy” that leads to a not-so predictable climax that is also just as entertaining. While some of the story goes into areas of no large concern and the film seems to lose a tiny bit of focus in the middle with some of the characters, the cast is great in each of their roles (secondary or primary) and the entire amount of work put into creating this investigative film rewards the viewer with near perfection and enjoyment. Starring: Logan Lerman (Percy Jackson & the Olympians: The Lightning Thief), Emma Watson (Harry Potter), Ezra Miller (We Need to Talk About Kevin) and more. Prior to seeing the trailer for The Perks of Being a Wallflower, I never had read the book and I knew little about the story. It was, for all intents and purposes, just a wallflower to me. Barely noticed. So, the trailer took me for surprise when, after seeing the quick clip, I knew I had to see it. The characters grabbed me and I could not wait to see it…only, it had to take 8 weeks from its initial theatrical release to reach my local theaters. Finally, after hearing so many wonderful things from other friends who had watched the movie, I finally got to see it. Was it worth the wait? (Well, the wait was annoying, but I will say that I was glad I was able to watch it after all that time!) The movie ended, I went to go see it again, and the fact that I keep thinking about the movie and try watching more clips again and again on the internet is a testament to the movie itself and its character development. I felt as if I knew the characters in the film and kinda miss these people being a part of my life after 2 hours (if that makes any sense at all). Perks of Being a Wallflower is a highschool centered character driven drama that follows an incoming socially awkward highschool freshman named Charlie (Lerman) who befriends socially “misfit” seniors in the same highschool who accept him and friendships grow. From the onset, the film lets you know that something dark has taken place in Charlie’s past and shows clips of his memory throughout the film. Coming full circle in the end, the present story of Charlie and his friends is the most captivating. Although it keeps one wondering just exactly what year everything takes place, we follow Charlie as he forges meaningful friendships with Samantha (Emma Watson), Patrick (Ezra Miller), his English teacher Mr. Anderson (Paul Rudd), Mary Elizabeth (Mae Whitman) and more. Charlie’s story and adventures mixed with the struggles and troubles of high school are impressively translated from real life, to the pages of the book, to the big screen with an intermittent narrative. The cast and the characters are fantastic in this movie, especially Lerman, Watson and Miller. The movie was most interesting when the three of them were together and I would not have enjoyed it as much if they weren’t in the film. Smart casting, smart use of characters, and smart creativity in allowing real-life situations to be related to by the audience through the characters. While there are a few seemingly unnecessary characters and while the story takes a heavier, darker and somewhat unexpectedly depressing turn for a little bit the movie takes real-life and presents it in a way that is truly well-done. It brought back some of the awkwardness and hardships of high school to mind and, admittedly, while I didn’t see too many actual perks of being a wallflower, I enjoyed very much watching these wallflowers grow to being more together. A rather touching drama mixed with a great soundtrack full of mix-tape treasures! Next Movie News Monday for November 12, 2012. 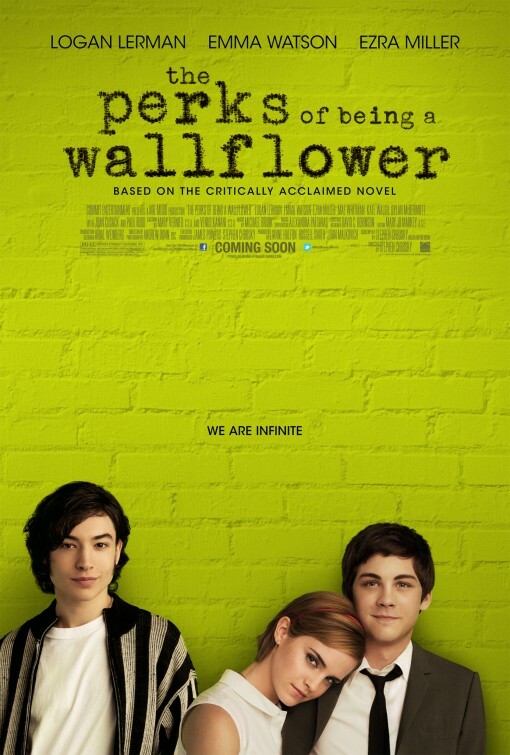 I really enjoyed Safety Not Guaranteed and I can’t wait to see The Perks of Being a Wallflower. Nice reviews. Thank you, Austin. I appreciate it. Apologies for my delayed response as I have been ultra busy. Glad you enjoyed the reviews. Thanks for the kind words. Hit me up after you’ve seen Perks. I’ll be interested in knowing which you liked more? I agree, Safety was just Ok. Wallflower I’m looking forward to seeing especially for the soundtrack. I truly can’t wait for your thoughts once you see Perks. If I miss your review, PLEASE send me the link so that I catch it. Thanks. Ok, I’ll definitely be renting ‘Perks of Being a Wallflower’ as my friend Kristin raved about it and now you gave it a high rating as well. Nice mini reviews, T! Thank you Ruth. Yes, be sure to check it out. It’s so good, my friend. Look at you – T the Hipster!! haha. yeah, I feel kinda like a hipster. These are the ones I am drawn to most lately it seems. I used to be all about the action flicks, but over the past year or two, my movie tastebuds have altered. hahahaa. Glad you liked these the same! Thanks for stopping in. How are things for you across the pond lately? Indeed I did. They were a couple of hopeful, yet unexpected delights. Thought Perks was great and it seems to have really struck a chord with many people. I think there’s something in the film that pretty much everyone can identify with, especially if you’re of a particular age. If you haven’t read the book yet I’d still recommend doing so; if you liked the film, there’s a very good chance you’ll like the book. I haven’t seen Safety Not Guaranteed yet, but I loved The Perks of Being a Wallflower. Glad to hear you’re a fan as well, T! Yes, It was so very good. A little different in the direction it took, but the characters overshadowed almost anything negative I thought about it. Such a great film. 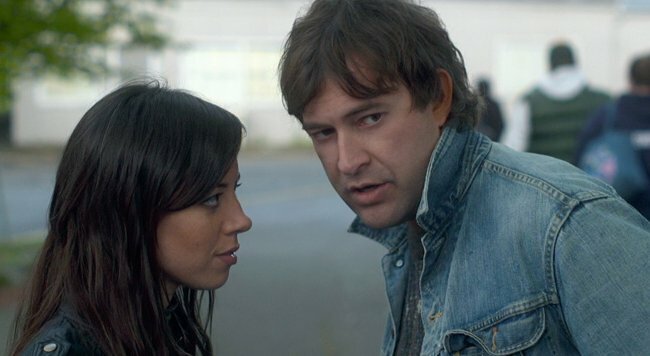 Will you be seeing Safety Not Guaranteed any time soon? Yep, it’ll be the next movie I rent from Redbox. Hopefully next week! I look forward to hearing your thoughts man.